India's manufacturing PMI index continues on a positive path maintaining its growth outlook. The index stands at 52.2 in September, 2018 as compared to 51.7, the previous month. 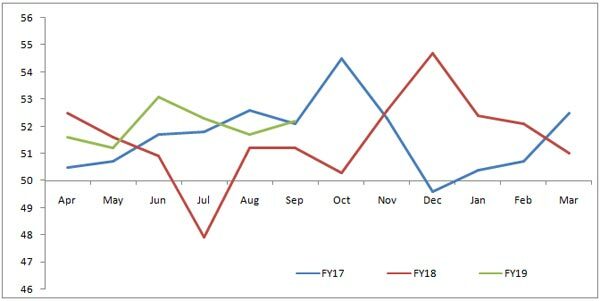 The index continued to be in positive trend for past fourteen months – indicating a solid growth in the manufacturing segment. On a YTD basis, the average index number has been recording 52.0 in FY19 (YTD), which was 50.9, a year earlier. The factors underpinning the overall index are new orders (both from domestic as well as foreign clients), faster inventory clearance due to strong demand, and rising staff levels. It is understood that the index consists of new orders, inventory levels, staff levels and future outlook. The healthy performance of manufacturing sector is reflecting in the IIP index as well. The index has been expanding at 5.5% in FY19 YTD. However, the run of expansion is expected to be undermined by rising input costs. The major concerns in the coming months are weaker value of rupee and higher commodity prices (mainly crude and steel). These factors are mounting pressure on input costs. We believe that the consumer inflation (CPI), which is decelerating for the past three months, is expected to move up September onwards.